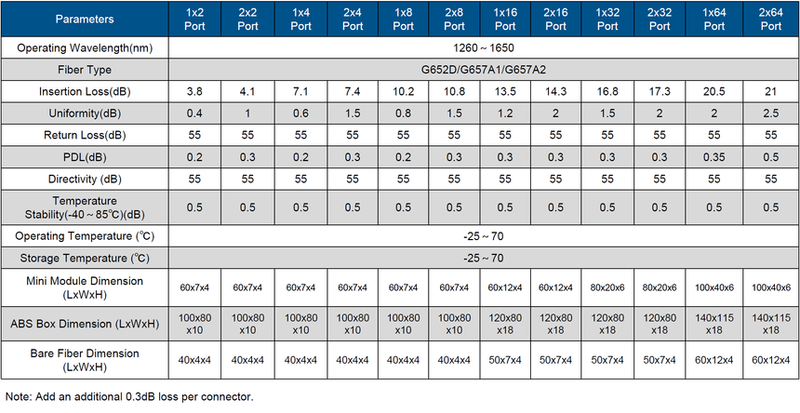 Fibre optic splitter is a network component that distributes incoming light (one or two input fibers) in equal parts towards multiple output fibers (2-64). Splitters are available with 250 μm bare fibers, 900μm buffered fibers and 2.0 mm cords. Input and output cords and fibers can have various lengths and can be terminated by optical connectors. KINGTON fibre optic splitters can be integrated inside several products and/or applications in combination with keen fibre or cable management systems. All products meet Telcordia 1209 and 1221 reliability requirements and are certified by TLC for network deployment. Fibre optic splitter is a network component that distributes incoming light (one or two input fibers) in equal parts towards multiple output fibers (2-64). Splitters are available with 250 μm bare fibers, 900μm buffered fibers and 2.0 mm cords. Input and output cords and fibers can have various lengths and can be terminated by optical connectors. KINGTON fibre optic splitters can be integrated inside several products and/or applications in combination with keen fibre or cable management systems. All products meet Telcordia 1209 and 1221 reliability requirements and are certified by TLC for network deployment.